Here’s a lovely idea for a beautiful breakfast. Simplicity at its best. No need for a recipe really. Just add sunshine and smiles and you will have a simply relaxing breakfast for a lazy Sunday morning or whenever you feel like it! The egg cup was sent from Europe to my mother and father when I was born. That means it’s pretty old. Over the years it has developed a soft patina and it’s been kept well, just like me. 🙂 The very special antique spoon is designed based on the legendary and romantic Thousand Year Rose. The elegant floral platter is of European origin. And the embroidered tablecloth was handmade by my great grandmother. Soft boil Mt Roland Free Range eggs. 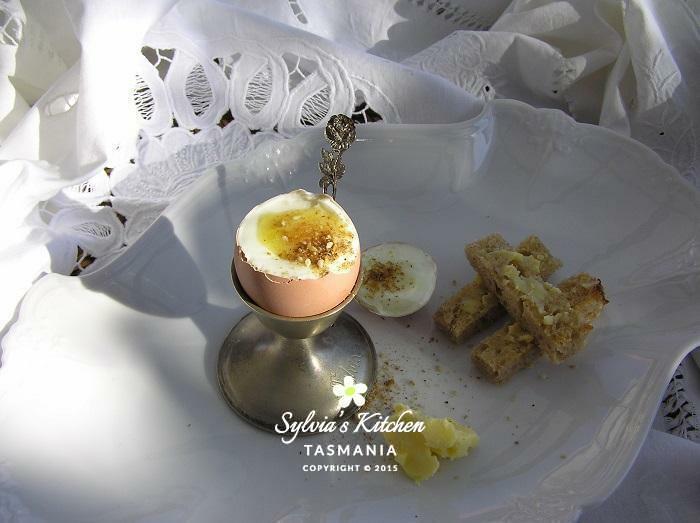 Place in lovely little egg cups on serving plates. Toast thick cut slices of Manu Bread or Sandy’s Sourdough bread. Cut into little soldiers. Spread soldiers with Tasmanian Butter Co. butter. Slice open the top of the egg. Dust the golden yolk with my authentic Handmade Egyptian Dukkah or other fine ground spice and nut mix. Add sunshine and you have a simply beautiful breakfast. This entry was posted in Autumn, Local Produce, Recipes. Bookmark the permalink.